Living the life of your dreams begins with the dreams themselves. Six years ago, I couldn’t tell you what my goals were beyond the desire not to be so stressed. I was juggling a demanding job, daunting house maintenance, and single parenthood. I was overwhelmed and lost. After my marriage failed, I knew one thing for sure; I needed to reconnect with myself. I had been stuffing my feelings deep inside. It was suffocating me. As a result, my sense of self was murky. My state of mind was visually represented in my messy, cluttered house. Like many things in life, the first step toward change is awareness. It was painfully obvious to myself that I was stressed to the max. Check. But how to become less stressed and hopefully more fulfilled? An excellent place to start seemed to be to reduce the stressors in my life. That eventually led me to begin the downsizing process. Beginning this process seemed incredibly daunting. My boyfriend and veteran downsizer, Christian, proved to be a significant source of support and coaching. He encouraged me to focus on one room at a time and start with the easy-pickins in each room, the real junk items. I spent most of this process alone, combing through my belongings after my son was in bed. I can’t say that it was always enjoyable, but it was definitely quality me-time. Often it felt like walking down memory lane. Remembering the good and bad from the last decade. Like sorting memories, I would hold each and every item. Pause for reflection then mark it has keep, discard, or giveaway. My keep collection was divided into two categories: can’t live without it or not sure. When going through a big transition, profound reflection is required to break through to the other side. Forcing myself to sit with myself and process my feelings about each of my belongings was just what I needed. I didn’t realize this right away; it felt like a never-ending chore for the first quarter of the process. Item by item and layer by layer, downsizing started to become exhilarating. How good it felt de-clutter my space and unburden myself from the noise that was cluttering my mind. It was a healing process, an act of self-love. I was letting go of things that were holding me back. What I discovered was by minimizing my possessions, I began to uncover myself. I was learning what was most important to me and what wasn’t. "Things" were definitely low on the priority list. What I wanted more of was that exhilaration feeling. If something as simple as getting rid of stuff could make me feel this good, then making more changes could only feel better. Downsizing empowered me to see myself as capable of evolution. My world viewed expanded because I took direct control of my life, and navigated myself through the rocky waters of a big life transition. Ultimately the downsizing process prepared me to take risks. And there is no adventure without a bit of danger. I took the most substantial risk of my life by leaving my steady job to pursue a passion project, Tiny House Expedition. Christian and I built a tiny house and have been traveling with it for three years, creating documentaries and educational resources. It is fulfilling work that has made me rich in experiences. Even without travel, I've realized that living tiny provides me with more opportunities for everyday adventure. The pleasant side effect of being more connected with my surroundings, no matter where we are parked. This connection means more time with nature and more spontaneous encounters with the neighbors. Living simply and more consciously has given me greater gratitude for the what I do have. No more taking my things and my space for granted. What I do have are essential to my daily life and enjoyment of my life. Quite fulfilling. 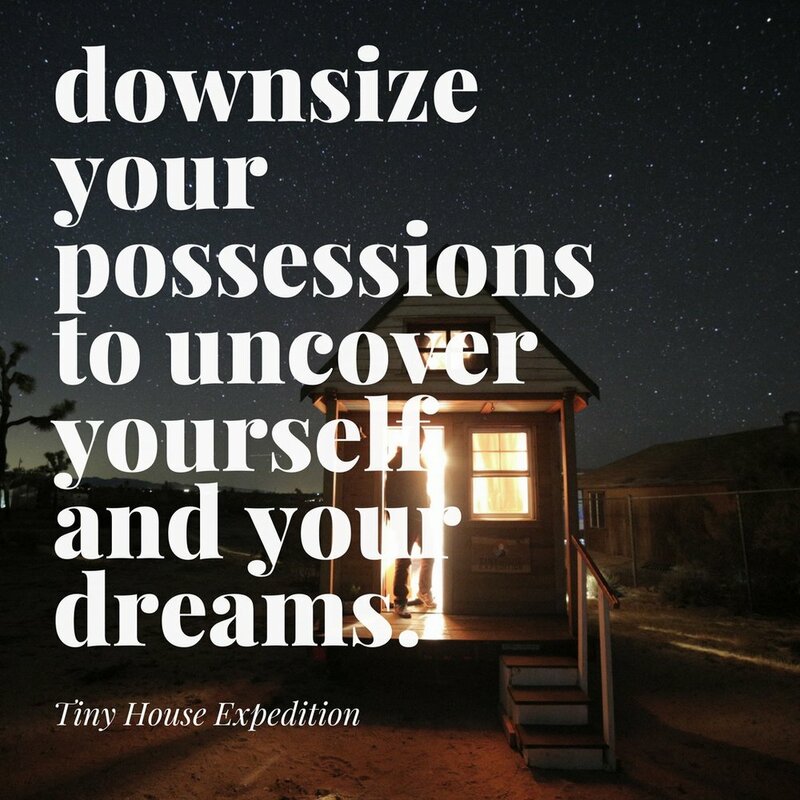 My advice: downsize your possessions to uncover yourself and your dreams. co-founders of Tiny House Expedition are filmmakers, DIY tiny house dwellers and advocates. They are inspiring others to redefine home and rethink housing through educational events, resource sharing and thought-provoking storytelling. Their documentary work includes the acclaimed educational docu-series, Living Tiny Legally. With their tiny house in tow, Alexis and Christian are on extraordinary road trip across North America— the world’s most traveled with almost 50,000 miles traveled and counting! Follow their adventures and stories on Facebook, Instagram and YouTube. And check their how-to tiny house travel guides here.